Our email marketing tool was reporting an email open rate that was too low. Here’s how we figured that out and measured the real rate. If you are an experienced email marketer, you probably know that the open rate that you see on your screen is not accurate. Even popular tools like HubSpot, MailChimp and Marketo cannot accurately measure your open rate, regardless of how many brilliant engineers they have. And, if you try to explain to your boss or client that your open rate is an unknown percent higher than the number listed… good luck! 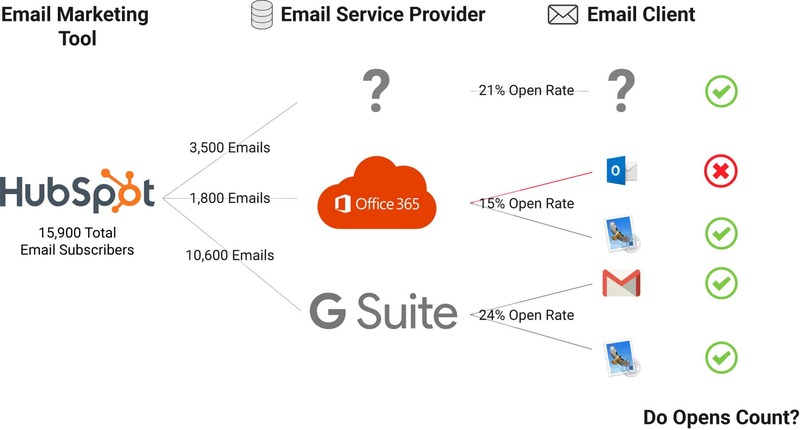 Here’s why email open rates are constantly underreported: Part of your list uses Microsoft Office 365 as their email service provider. That much is guaranteed. If these list members also use Outlook to view their email, their email opens (most likely) will not be reported to your email marketing tool! I’ll get into a deeper explanation in a moment. This creates a few challenges besides open rates. If you want to stay out of spam filters, you need to remove the least engaged portion of your list every few months. But… you could be simply removing all the Outlook users as well, happy or unhappy. And, when a salesperson is trying to see if a potential customer is still interested, they may be relying on bad email engagement data! First, here is a brief summary of the way that email marketing software tracks open events. 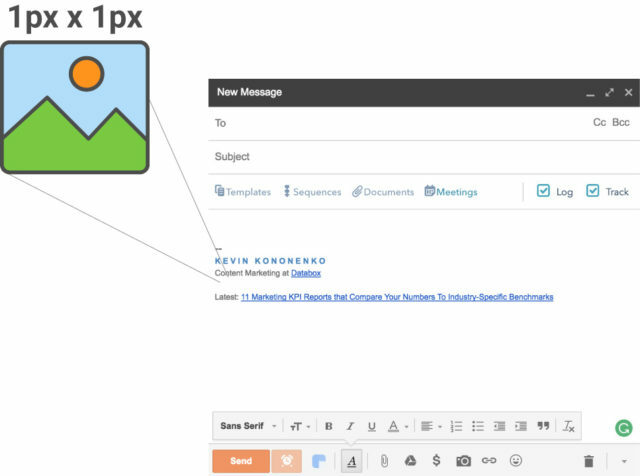 Whenever you send an email from HubSpot, for example, there is a tiny 1 pixel by 1 pixel image included. When an email client loads that image, it fires an event that is tracked by email marketing software. An “email open” really means a specific image has loaded. That image has a unique code that is tied to the specific email address on your email list. 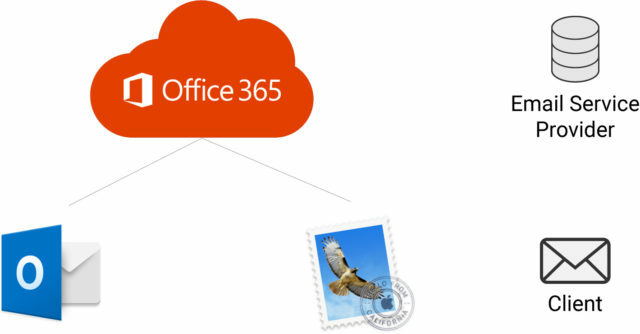 Many companies use the Office 365 suite, which comes with email services. The default email client, or user interface for email, is Outlook. But Outlook does one thing differently than other popular email clients. It does not load images by default! So, there is no way for your email marketing software to know if an email has been opened. If you like to send plain-text emails for marketing or sales, there is no incentive for the recipient to “Download pictures” because there are no images within the email body. But, there is not a 1:1 relationship between Office 365 as an ESP and Outlook as an email client. Plenty of people prefer the Apple Mail interface, and since that is the default on the iPhone, many choose to stick with it on mobile. In that case, images are downloaded by default, and therefore open data is accurate. And, to make things more complicated, recipients can change their default settings in both Outlook and Gmail to auto-download pictures. Some Outlook opens may be tracked accurately, while some Gmail open data may be inaccurate. Changing this default setting is rare, though. What was the normal open rate for our emails by ESP? How many email subscribers might be using Outlook? 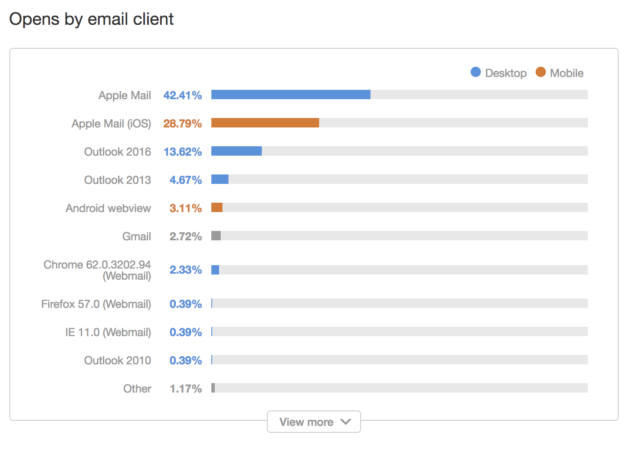 Only 18% of those who opened the email were using the Outlook email client, and all were on desktop. That can’t be right. If we assume that 23.2% of Office 365 users opened the email as well, HubSpot could not track about 150 open events. That being said, link clicks are always tracked accurately, so the click rate should be correct. It is possible to have a link click without a corresponding email open! Okay, maybe 150 opens is not the biggest change in the world for a list of around 16,000 people. This impact will vary based on the composition of your list. Office 365 is more popular with large enterprises, while Google Apps are more popular with small and medium-sized businesses. Since our list is mainly composed of SMBs, it is not surprising that there are so many Google users. But, if we focused on enterprises, I would expect the opposite: a large percentage of Office 365 users. In fact, enterprise accounts create another challenge: email deliverability. If you are using account-based marketing to reach out to one specific account, you need to make sure that your emails do not get sent to spam by the company’s mail servers. If many employees use Outlook… it may appear to the mail servers that very few employees open your emails. One other factor: mobile versus desktop. Many email marketers find that a majority of their emails are opened on mobile, but about 66% of our emails are opened on desktop. This was consistent across all 3 ESP buckets. Since iPhone is more popular than Android in the United States, you may see a more accurate number if more of your subscribers use Apple Mail on iOS rather than desktop. If you repeat this analysis, you will have a more accurate open rate that you can give to your boss or client to measure your performance. And you will know the scope of the problem for your database. But, what can you do with this data to improve your results? Here are a few actions you can take to get a higher ROI from your list. If you have experience with Facebook Ads, you are probably familiar with retargeting list subscribers who open your emails or visit your website. But did you know that AdWords has a similar offering called Customer Match? Just like Facebook, you can retarget your subscribers who have taken a specific action on your site or in email. Except since you are using Google’s network, you can reach them on YouTube, Gmail or through the Search Network. Facebook relies on personal emails matched to profiles. But, AdWords can use business email addresses that are hosted on Google Apps. 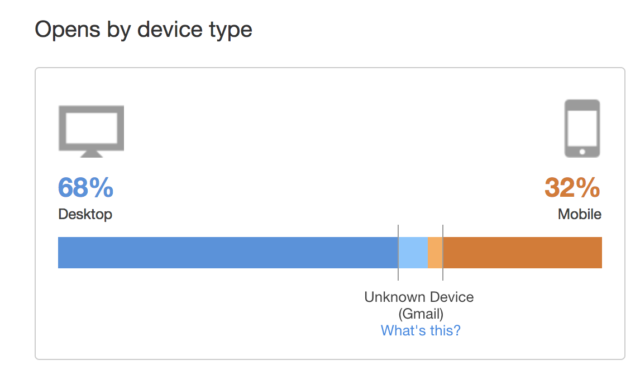 Normally, it can be tough to tell if a specific business email uses Google as its ESP. But, using the Google ESP list from Seventh Sense, you now have a list of subscribers that you can retarget through AdWords. You need a minimum of 1000 emails to set up an audience. There is an easy way to get more accurate data from Outlook users- send emails with more pictures! Your subscribers will need to click “download pictures” to experience the email in the correct format, and your email marketing tool will collect the open data. To improve deliverability, you should stop sending emails to people who don’t open or click your messages. Since it’s difficult to get accurate open data for Office 365 users, you may want to continue emailing them with images in the email. If your list is mostly Google customers (like ours is), you can safely remove inactive subscribers that use Google, since their open data is accurate. Yes, you may have been miscalculating your open rate for years. But, at the same time, there have not been any options in the past to measure this phenomenon. Since we use HubSpot, we set up a Smart List for each of the three ESPs. When we look at our open rate, we now look at 2 out of 3 buckets and take a weighted average. If you use HubSpot or Marketo, you can do the same!